Evidence of acute nursing shortages in urban hospitals has been surfacing since 2000. Further, new graduate nurses account for more than 50% of total nurse turnover in some hospitals and between 35% and 60% of new graduates change workplace during the first year. Critical to organizational success, first line nurse managers must have the knowledge and skills to ensure the accurate projection of nursing resource requirements and to develop proactive recruitment and retention programs that are effective, promote positive nursing socialization, and provide early exposure to the clinical setting. The Nursing Human Resource Planning Best Practice Toolkit project supported the creation of a network of teaching and community hospitals to develop a best practice toolkit in nursing human resource planning targeted at first line nursing managers. The toolkit includes the development of a framework including the conceptual building blocks of planning tools, manager interventions, retention and recruitment and professional practice models. The development of the toolkit involved conducting a review of the literature for best practices in nursing human resource planning, using a mixed method approach to data collection including a survey and extensive interviews of managers and completing a comprehensive scan of human resource practices in the participating organizations. This paper will provide an overview of the process used to develop the toolkit, a description of the toolkit contents and a reflection on the outcomes of the project. In 2008 the Nursing Secretariat of Ontario's Ministry of Health and Long-Term Care funded 17 demonstration projects aimed at developing and implementing best practice for nursing human resource planning. Nursing leaders at Mount Sinai Hospital, North York General Hospital, SickKids, St. Joseph's Hospital, St. Michael's Hospital, Sunnybrook Health Sciences Centre, Toronto East General Hospital and the Lawrence S. Bloomberg Faculty of Nursing at the University of Toronto created a partnership network and became one of the demonstration site projects. This paper describes and reflects on the development and dissemination of the Nursing Human Resource Best Practice Toolkit (NHRBPT). Within the context of jurisdictional and national health human resources (HR) planning efforts, the NHRBPT project was designed to help organizations and first-line managers conduct effective nursing HR planning at the level of a patient care unit. The NHRBPT had three main objectives: (1) to create a partnership network that facilitated the sharing of knowledge regarding nursing HR planning practices among the hospitals, and ultimately with other jurisdictions, (2) to develop an HR best practice toolkit that focused on five identified building blocks: planning tools, manager interventions, recruitment, retention and professional practice, and (3) to develop and pilot a workshop format to disseminate the toolkit content. 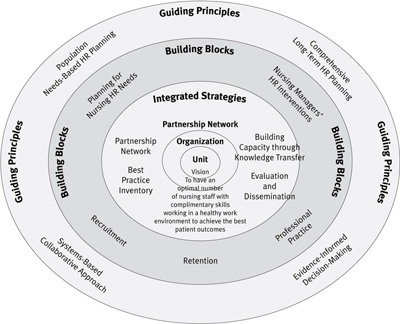 The partnership members' vision was to build nursing HR planning capability among nursing managers that would help attain optimal numbers of nursing staff with complementary skills, working in a healthy workplace environment to achieve the best patient outcomes (Beduz et al. 2009). Health human resources are critical to meeting the health needs of Ontarians. Policy makers and healthcare managers are challenged to ensure that the right number of people, with the right skills, are available at the right time to deliver health services at an affordable cost. Nurses make up the largest group of healthcare providers in Ontario's healthcare system, and evidence of acute nursing shortages in large urban hospitals has been surfacing since 2000 (Baumann et al. 2006). While the nursing community agrees on the important aspects of nursing HR planning, there is little coordination in the application of evidence-based planning to practice (McGillis Hall et al. 2006). One reason for this has been a lack of readily available evidence-based planning tools that support organizations and nursing managers in effective planning, recruitment, integration and retention. As a result, front-line nursing managers are still challenged with effective nursing HR planning. The NHRBPT is an attempt to bridge the gap between what we know about nursing HR planning and what we can do to improve the planning process and outcomes at the level of first-line nursing managers. Toolkits are collections of versatile, adaptable educational resources that are particularly useful for addressing complex issues. These issues change from one organization to another and require a high degree of local adaptation (Monroe 2000). When used by local champions, toolkits have been found effective in implementing selected best practice guidelines in a variety of healthcare organizations (Dobbins et al. 2005). More than a collection of information, the most useful toolkits have structured interactive content to facilitate users' learning. The decision to develop the NHRBPT resulted from senior nursing leaders recognizing a need to develop an evidence-informed, practice-ready resource for first-line nursing managers, coupled with a targeted dissemination strategy to maximize the resource's adoption. Strategies that seek to consolidate information in regular reports would improve the planning and evaluation cycle of nursing HR management for first-line managers. A variety of strategies are used by first-line managers to meet the goal of having enough staff, with sufficient experience to provide cost-effective quality patient care. First-line managers identify peer mentoring and access to, and support from, their direct supervisor as the most common mechanisms for attaining competency in nursing HR planning and other leadership and management skills. The NHRBPT was conceptualized using a guiding framework developed by an expert panel of representatives from the partnership network (Appendix 1). 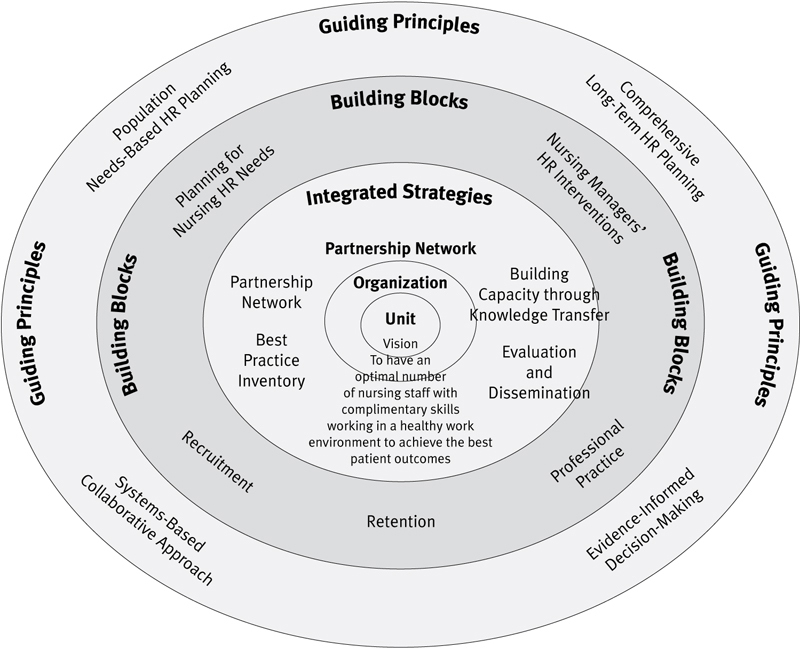 The framework reflects the network's vision, which is achieved when best practices in each of the five building blocks (planning tools, manager interventions, recruitment, retention and professional practice) are integrated into an overall plan. The plan is founded on the principles that HR planning is population based, comprehensive and long-term, uses a systems-based collaborative approach and is informed by evidence. The building blocks selected for inclusion in the framework were developed following a literature review of human resources management concepts. They consisted of key strategies to consider in developing a comprehensive organizational HR plan (MOHLTC 2007). The rationale for selection of the building blocks is reported elsewhere (Burkoski and Tepper 2010). A number of steps were involved in developing the NHRBPT: An extensive review of the literature, research and published practices from other jurisdictions on HR practices was launched. An organizational survey was developed, along with a nurse manager survey and key informant interviews. Tools, templates and resources were collected from each of the partner organizations and analyzed. Details of the methods are described in the published toolkit, which can be downloaded from www.mountsinai.on.ca/nursing. This chapter focuses on the process for assessing and determining nursing HR needs at the nursing unit level through use of structured tools such as nursing unit staffing projections and forecasting tools. Needs-based HR planning tools help nursing managers and other decision-makers determine workforce needs in both the short and long term. A number of tools are available to aid in decision-making processes, and they require access to appropriate data sources. Use of data such as utilization of nurses in full-time equivalents (FTEs), budgeted positions and workload measurement information is integrated with the forecasting process. An extensive case study demonstrates the utility of the data and planning tools. Effective allocation of human resources is integral to the first-line nursing manager's role. The nursing manager's success in creating effective work teams and implanting flexible strategies has a positive impact on the quality of work life for staff and quality of care for patients. Planning for adequate deployment of nursing human resources is an essential skill. However, nursing managers receive little or no formal training in deployment strategies and scheduling practices. The focus of this section is on scheduling practices and tools. Creating an integrated short- and long-term recruitment plan for a unit or organization is essential. This chapter focuses on recruitment strategies at the organizational and unit level. It identifies target groups for recruitment and explores target-specific recruitment strategies such as clinical placements, recruitment campaigns and mentorship/preceptorship programs that attract nurses to an organization. Organizations that are better able to recruit and retain staff have better evaluations of the quality of care that is provided. For example, hospitals with turnover rates under 12% have lower risk-adjusted mortality scores and low severity-adjusted lengths of stay when compared to hospitals with turnover rates of 22% or more (Cantrell and Browne 2006). The ability to retain staff members and reduce the turnover rate is an essential characteristic of a successful long-term HR planning process. This chapter focuses on emerging trends among new graduate nurses, mid-career and late career nurses and identifies age cohort-specific retention strategies. These strategies include intergenerational strategies, rewards, recognition, innovative scheduling and flexible work hours. Over the past two decades, the term "professional nursing practice" has become increasingly integrated and recognized within the nursing community. Professional practice, as an entity, is a system of strategic processes, including both intraprofessional and interprofessional factors that underpin the delivery of skilled, responsive nursing care and the control of a high-quality work environment. Organizational professional practice frameworks have been advocated as resources to help organizations guide the development, advancement and effectiveness of nursing performance standards, and to attract, retain and reward nurses (Robinson et al. 2003). This chapter focuses on an extensive review of the literature on best practices in professional nursing and steps for implementation at the unit and/or organizational level. Actions to develop nursing professionals, steps toward interprofessional collaboration and issues in policy-making and education are addressed. We hosted an expert-facilitated workshop to disseminate the toolkit content to nurse managers. We used a unique knowledge translation strategy to build capability for HR planning among participants, using open space learning methodology. The full-day workshop was designed specifically to support first-line nurse managers in testing the applicability and usefulness of the HR planning toolkit. Each organization identified nursing managers to attend, and 52 participated. They represented all partner organizations and had a variety of managerial experience, ranging from one to 10+ years. Eighty-three percent of participants submitted an evaluation of the workshop. The majority claimed that the workshop was relevant to their work (95%), that it enabled them to achieve the stated objectives (79%) and that it would alter their practice (76%). Key areas identified for practice change related to the use of forecasting tools, scheduling and retention strategies. In total, 96% of respondents said that the workshop met their expectations. Many commented on the networking opportunities the workshop offered. One participant suggested that "it was an excellent session as it gave the opportunity to engage with other managers across the GTA." Competing priorities within teams and organizations. Creating the partnership network and the subsequent NHRBPT project arose from a recognized immediate need for evidence-informed planning tools that support organizations and nursing managers in effective HR planning, recruitment, integration and retention of nurses. Beyond this project, organizations must continue to provide other forms of support, guidance and training to their nursing managers for creating a successful health HR plan. Feedback from the workshop indicates that nursing managers are most attuned to the subjects of retention, nursing manager interventions and HR planning. Workshop participants specifically highlighted the importance of strong leadership (at a variety of levels) and higher-level buy-in to implement new nursing HR best practices. Nursing managers may need to consider how they will approach the implementation of these best practices, and whom they will address to achieve this buy-in. Individual organizations in the partnership network have gained considerable expertise in HR planning. All partner organizations have benefited from the comprehensive review of nursing HR planning practices. From the process used to develop the toolkit contents – including the literature review, nursing manager and organizational surveys and interviews, and feedback from the workshop – the expert panel developed a set of recommendations. These recommendations, described below, should inform future action in nursing HR decision-making and planning. Funding for future initiatives should be aimed at supporting the uptake and implementation of initiatives identified in the evidence and NHRBPT to advance the capacity of nursing HR planning at the organization and unit level. Role expectations, educational preparation and opportunities for professional development for first-line managers vary among organizations. Evidence suggests that there are specific leadership and management competencies for first-line nursing managers that are tied to outcomes for nurses, patients and organizations. Future initiatives should be aimed at defining core competencies and providing formal mechanisms to assist nursing managers in achieving them. Organizations should ensure that adequate training is provided to first-line nursing managers to ensure they are developing skills in effective HR management, including planning and forecasting; and recruitment, including interviewing, bias-free hiring, and use of different types of recruitment and retention strategies. In our interviews with experts, all nursing managers stated that in learning about staffing and scheduling, most had relied on their colleagues for support or taught themselves. Formal mechanisms for learning staffing and scheduling techniques would have been very helpful to them as new nursing managers. Organizations should provide structures for internal and external networking for first-line managers. First-line managers identify peer mentoring and access to, and support from, their direct supervisor as the most common mechanisms for attaining competency in nursing HR planning and other leadership and management skills. Organizations should consider developing formal mentorship and support programs for first-line managers. Retirement trends in past years and future projections based on age of staff. Nursing managers should be provided with guidance in the understanding, analysis and utilization of reports on HR planning and encouraged to review their planning regularly. Regular reviews of staffing and scheduling procedures are recommended (minimum yearly) in order to be responsive to recruitment and retention issues. In addition, triggers such as staff complaints, increased sick time or overtime may warrant a review and further action. Creating healthy workplace environments and providing adequate training opportunities for new nurses, as well as supporting professional development, are important steps in both the recruitment and retention process. The NHRBPT is based on the results of the review of hospitals' and nursing managers' practices and an extensive review of the literature. The coordinated approach for the collection and interpretation of data was conducted so that the information can be widely adopted by other healthcare organizations to support nursing HR planning. Using this approach makes the toolkit relevant and accessible to specific sectors (the development of tools was at the grassroots level) and fosters collaboration between organizations and mangers within the network. In this sense, the project served as a vehicle for ongoing sector and Local Health Integration Network engagement and collaboration. It promotes sector- and system-wide solutions, and it encompasses and aggregates knowledge across the nursing profession. The NHRBPT also addresses a significant gap in the current nursing health HR landscape. It provides a comprehensive, evidence-informed resource for first-line nursing managers in nursing HR planning. It is an integrated approach to dissemination through the provision of practice-ready tools, case studies and implementation strategies for an immediate knowledge-to-action process. Download the toolkit Building Capacity in Nursing Human Resource Planning – a Best Practice Resource for Nursing Managers at www.mountsinai.on.ca/nursing. Correspondence may be directed to: Leslie Vincent at lvincent@mtsinai.on.ca. We wish to acknowledge the contributions and expertise of the expert panel who guided this project: Alison Gilmour, Mount Sinai Hospital; Faith Boutcher and Mohini Pershad, North York General Hospital; Pam Hubley and Margaret Keatings, SickKids; Mary Kapetanos and Sandra Lenarduzzi, St. Joseph's Health Centre; Martine Andrews, Joyce Fenuta, Kaiyan Fu and Norine Meleca, St. Michael's Hospital; Betsy Jackson and Beverly Wait, Sunnybrook Health Science Centre; Kimberly Graham, Toronto East General Hospital; and Linda McGillis Hall, Lawrence S. Bloomberg Faculty of Nursing. Baumann, A., J. Blythe, K. Cleverly and G. Grinspun. 2006. Health Human Resource Series Number 2. Educated and Underemployed: The Paradox for Nursing Graduates. Hamilton, ON: Nursing Health Services Research Unit, McMaster University. Beduz, M.A., L. Vincent, L. and E. Pauzé. 2009. Building Capacity in Nursing Human Resource Planning: A Best Practice Resource for Nursing Managers. The Nursing Human Resource Planning Best Practice Toolkit Project. HealthForceOntario. Burkoski, V., and J. Tepper. 2010. "Nursing Health Human Resources Demonstration Projects: Creating the Capacity for Nursing Health Human Resource Planning in Ontario's Health Care Organizations." Canadian Journal of Nursing Leadership 23(Special Issue, May): 51–60. Cantrell, M.A., and A.M. Browne. 2006. "The Impact of a Nurse Externship Program on the Transition Process from Graduate to Registered Nurse: Part III. Recruitment and Retention Effects." Journal for Nurses in Staff Development, 22(1): 11–4. Dobbins, M., B. Davies, E. Daneseco, N. Edwards and T. Virani. 2005. "Changing Nursing Practice: Evaluating the Usefulness of a Best-Practice Guideline Implementation Toolkit." Canadian Journal of Nursing Leadership 18(1): 38–48. Retrieved March 12, 2010. <>.http://lib.bioinfo.pl/pmid:17242391>. Ministry of Health and Long-Term Care. 2007. Call for Applications for Demonstration Site Projects for Nursing Human Resources Planning. Retrieved January 11, 2010. <http://www.health.gov.on.ca>. <http://www.ontla.on.ca/library/repository/mon/19000/277121.pdf>. Monroe, M. 2000. "The Value of a Toolkit." Journal of Extension 38(6): Retrieved March 12, 2010. <http://www.joe.org/joe/2000december/tt5.php>. Robinson K., C. Eck., B. Keck and N. Wells (2003). The Vanderbilt Professional Nursing Practice Program. JONA 33 (9), 441-450.